Diamonds are forever! Before buying your forever Diamond Ring, you must know important aspects of diamond jewellery, the most important feature being its setting. The craftsmanship of a setting gives the ring the overall style. You may like a ring for its only setting. 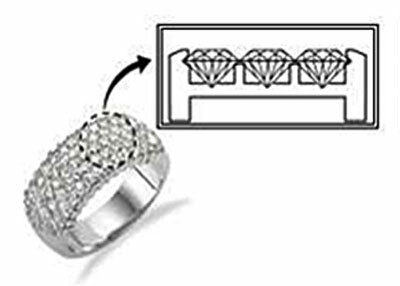 Thus, given below are some types of settings that will help you know settings better, before you buy your diamond ring..
Prong setting is the most standard setting used in diamond rings. It basically protects and holds the diamond. Prongs are mainly four cornered but can go up to five to six if the design demands. There are many types of Prongs that are customized according to the customer’s need. These types include single, double, triple and personalised decorative prongs. There is also a V-prong setting which is used for pear shaped and marquise stones, it helps in protecting the pointed tips of the stone from breaking. The prong setting permits the centre stone to be raised above which makes the stone look larger with the only glimpse of beautiful metal. 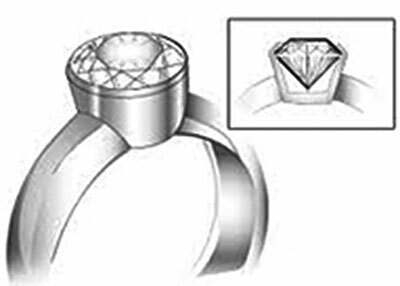 Prongs can be moulded outwards and upwards, clutching the diamond with its top view. 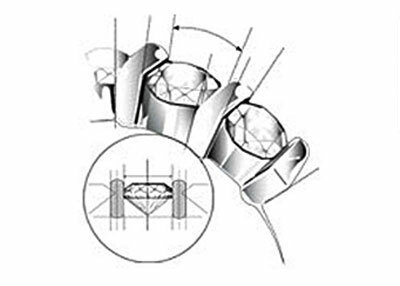 This setting plays a vital role in making the ring strong and durable. It is also instrumental in giving an elegant look to the ring and hence, it is mainly used for wedding and engagement rings. In a bezel setting the solitaire is bordered with metal giving it a well finished and clean look. Bezel setting comes in two types-complete and half. In Complete Bezel setting the stone is covered fully giving it a sophisticated touch. However, a Half Bezel setting diamond is partly surrounded by the metal which gives the ring a modern aspect. Diamond when teamed with white gold for a bezel setting, makes the diamond appear bigger. 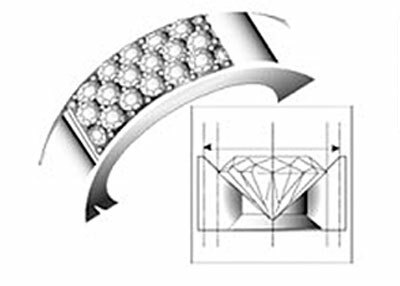 Channel setting, as the name suggests, is a channel; this channel is a two sided metal channel between which gemstones are lined up in a uniform pattern. 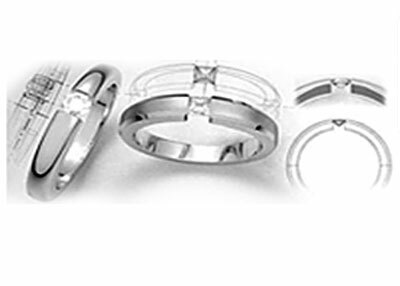 Channel setting is the most secure setting which protects the gemstones with a sleek finish. It also makes the ring free from getting caught up in the hair or clothing. This setting is a popular one used mainly for engagement rings. 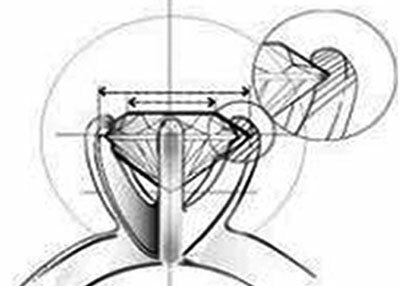 In flush setting, gems are implanted in the metal ring band leaving the crown of the gem visible. The whole of the metal ring safeguards the gemstones. Flush setting indeed makes the ring appear alluring! Similar to the channel setting, the Bar setting has parallel bars holding the solitaire firmly between them. While other parts of the solitaire remain unhidden, the ring appears to be delicate but is indeed strong and stout. The word comes from the French word ‘pave’ (pronounced as ‘pa vay'). In a pave setting the surface of a jewellery item appears to be covered with tiny diamonds. The use of multiple stones in pave setting forms an illusion of bigger jewellery. 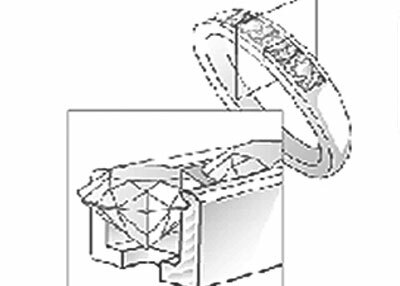 Invisible setting allows the diamonds to hover over the ring without any disturbance of the prongs. The placing of diamonds is done in such a manner that even the metal beneath is not visible. Invisible setting is a flawless structure of the ring which shows more of the diamond than the metal. As the name goes, this setting creates an illusion of a bigger stone. 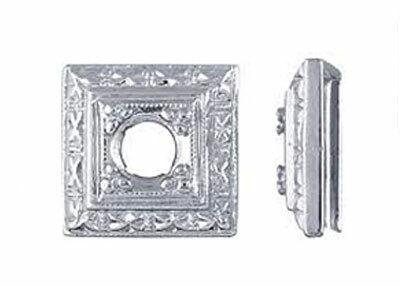 In this setting, generally, the prongs are more decorative which enhances the overall illusion. 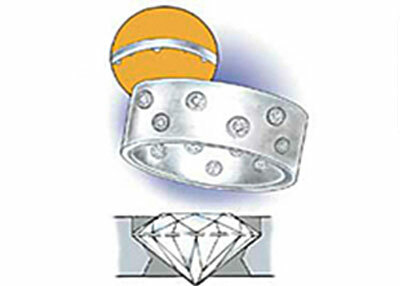 Here, the diamond is held between the ring with pressure and not by prongs or invisible strings. The diamond appears to be floating and is open on the sides. This diamond setting is a strong and secured one. Above are a few noteworthy settings which will help you to select your forever diamond with a setting that goes best with it. Now you are all set to know what really suits your personality and occasion. In case of any doubts, feel free to call us on our toll free number 1800 2700 610 or email us at info@mehtajewellers.net.in.